Professor Joy Chioma Nwabueze is the first female professor of statistics in Nigeria, as well as the first female professor in Nigeria. Mrs Nwabueze is also the Deputy Vice Chancellor (DVC), Administration and a pioneer Dean, College and Physical Applied Sciences, Michael Okpara University, Umudike, Umuahia. But in spite of her academic heights, she is a study in humility, an accomplished woman of God and a bundle of beauty in all ramifications. Soft-spoken but loaded with wisdom and knowledge, she walked this reporter through her academic journey and how she was able to weather the storm on her way to greatness. 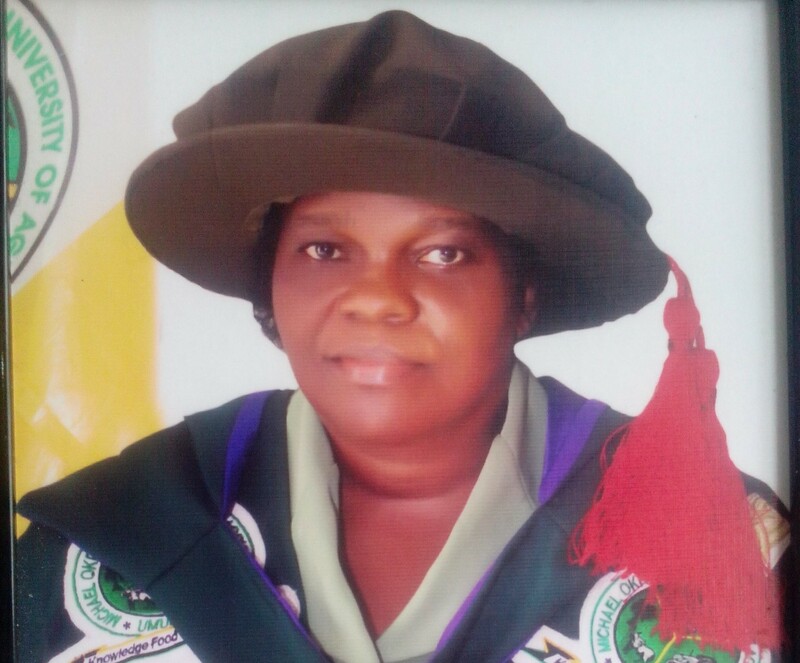 “I am the first female professor of statistics, the Deputy Vice Chancellor, Administration, Michael Okpara University, Umudike, Umuahia and by the Grace of God, the first female professor in Nigeria,” she enthused. How do you feel being the first female professor of statistics in Nigeria? Well, each time I remember it I feel very grateful to God because He owns everything and by His Grace, it’s like this is for you because I had quite a number of hiccups coming up as a young academic, but God saw me through. Each time I remember it I give a flag offering unto the Lord. Can you walk us through such hiccups? They are not so fantastic, but each time I remember them I give glory to God. So, what I am saying in effect is let’s just forget about them and trust God that they will not appear in some other persons. How do you feel having men under your control? Your guess is quite right. I pioneered the Department of Statistics and I am the pioneer head of the Department of Statistics, setting it up. Among the staff members, I think I was the only lady, but we worked like sisters and brothers. However, I never pushed them around, but we reason together. Of course, you know women with the labour pains and everything they are more meticulous in setting up a system. So, I laid the building bricks of that department and today it is standing. Again, I happened to be the pioneer dean as well of College and Physical Applied Sciences, Michael Okpara University, Umudike. Again, I used my God-given ingenuity to lay the bricks very solidly to His glory. Again, I happened to be the Deputy Vice Chancellor, Administration. What I am saying in essence is that I owe so much to God because it is not about me. It is all about the excellency of God and not of me because I may not have done anything different from what other people did. But God helped me. Has any man resisted your orders? I don’t give orders per se. I bring people to reason with me in quite a number of things. However, some people (both man and woman) are built for disobedience. Usually you make them to see reason and if they fail to, for someone that requires excellence in whatever you do, instead of wallowing in complaints and lamentations, you use your deft to make sure that things go the proper way. Some people are looking up to you. What advice do you have for them? By the grace of God, I am a pastor of the Almighty God. I always want to grow in Christ by deepening my relationship with Him at all times. Even in this position as DVC, Admin, my office is usually open to whoever, particularly to people who have been molested by whichever party. By the grace of God, I prayerfully make sure people gain their right because you find out that we are in a world where people want to deprive people of their basic rights particularly, when it comes to male-female issues. Growing up in my university days I was almost a victim of harassment by a lecturer. I am an advocate of making sure that no lady is molested for any reason because God used someone to help me. I almost failed my degree exam in the University of Nigeria because of wanting to harass and you are refusing. But God used a man to really help me and I still came out tops in my undergraduate days. So, I stand out tall for whoever that is being molested in that way or wants to be molested, but make sure the person works harder. That is the message I leave with the person. Have you had such cases in your own university? Of course, it abounds, not just in my university, but in almost all the universities. And even outside the universities. It is everywhere. It is a commonplace in Nigeria. How did you handle such cases? That is what I am saying. At such times you don’t allow the culprits to go scot-free. How many people have you punished? I don’t punish. The law punishes. The university punishes. How many have the law punished in your university? As I said, quite a number. I don’t have it off hand because we publish such cases in our bulletin. Due processes are followed before such a person is punished. There will be a committee set up to investigate the matter. But most times the victim will say, don’t worry. By the grace of God I have five children. How many of them took to your profession? The closest is a computer scientist. The other three are doing medicine and my little baby hasn’t taken a course. So, I have three medical doctors to be by the grace of God and I have a computer scientist. Do you guide them on course of study? don’t force them. We expose them and they pick their courses. are more patient. But that initial hatred, possibly from peers, will make you not to listen to it. But at the end of the day when you go into it you find out that it is very sweet. You don’t even have to read all day. All you need to know is what goes on and you pick it and once you pick it you have picked it. So, what I am saying in essence is that I like to encourage young girls. As a matter of fact I instituted a prize in my university for the best graduating female student every year. And we have some prizes. And we have some prizes for people in Maths, sciences. So, what I am saying in essence is that I want to encourage female students to go into mathematical sciences. How has statistics affected the economic development of Nigeria? Life I would say is all about statistics and statistics is all about life. Most of the times we trained statisticians, at times it is like you don’t want people to come into your area, but as I said, life is all about statistics. The woman in the kitchen takes the average of the things she wants to do. Assuming you want to prepare yam for your family for dinner, you take account of how many people in your household and the average of what everybody can eat. That is statistics. So, we need statistics anywhere, both in your family, in the kitchen. So, there is need for us to have statistical literacy, I would say, at the grassroots. Then, coming up to government, if we implement statistics, most of the problems we have in the country will be solved. What I mean is that if we get the actual data and implement it, some of the problems will be solved. National Bureau of Statistics (NBS) has been doing a great job, but what happens is that these pieces of data they collect are they being implemented at the higher level Statistics has helped quite a number of countries and Nigeria will not be an exception. When you talk about economic recovery and growth plan, you cannot divorce statistics from there. If you don’t know what had happened before, you might not know how to handle others. If you don’t know the exact number of people involved in different facets of the economy you might not be able to have a good set-up for them. So, what I am saying in effect is that statistics is very much needed and this is the time because for Nigeria to get from where we are we need statistics and implementation. The greatest problem Nigeria has is funding statistics, who do you think should fund statistics? Are you saying that most of the data from NBS are correct? wonder how far can such data go. NBS reports have not been audited over time, how credible are such reports? It is not just good enough because the importance of undertaking something is to make sure that it is quite useful to you. There could be an improvement by bringing in professionals into such functions or works.